The information below is an illustration of the most important differences between our service and facility and other clinics. It will illustrate these issues and help you to understand how picking a physician who employs inferior technology and services will ultimately effect your reversal result. 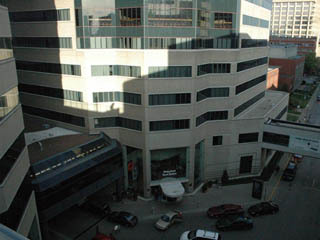 On the left-hand side, we will explain the world class hospital facility, top of the line equipment and surgical techniques that Dr. Levin uses to ensure the absolute best possible outcome for you. In addition, we outline the extensive services and follow-up care that Dr. Levin provides. We are committed to following through and not only making sure that you receive the best reversal procedure possible but that you also get the care to ensure that you conceive. In the right-hand column, we detail the less than optimal services and incomplete packages of other facilities. 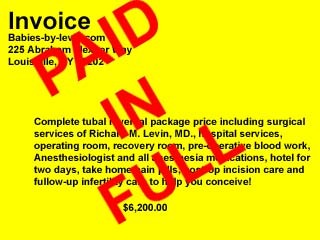 These doctors and clinics consider that their work is done after you leave the operating room and they have collected their check. Demand the best possible physician, technology, facility, follow-up care and package, so that you may achieve your ultimate goal: pregnancy! Us: Why is it necessary to perform the procedure in a hospital setting? While intra-operative complications are very rare, its much safer to have abdominal surgery in a hospital setting with enhanced facilities rather than a “free standing clinic” which is much more limited. 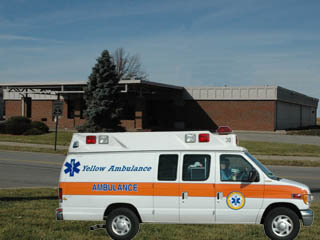 If you were to have a serious complication in the “free standing clinic”, you would have to be awoken and transported by ambulance to a full service hospital. 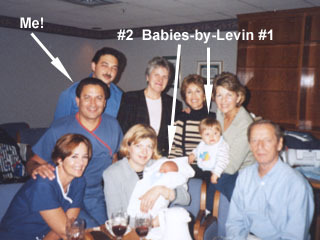 While certain reversal clinics will attempt to manipulate information and claim that there is a higher chance of getting a hospital acquired infection from being in a hospital setting, a review of the past 10 years of reversal records shows that Dr. Levin has not had a single patient who has had such as infection, demonstrating his immaculate operative and sterile techniques. It is of interest to note that these other reversal facilities administer prophylactic antibiotics to each and every one of their patients - a practice that Dr. Levin does not have to employ. This fact suggests that these other “free standing clinics” consider each and every one of their patients to be at considerable risk for this type of potentially serious infections. Not a risky freestanding clinic! Them: They perform all of their tubal reversals in drive-up surgicenters! Imagine, this could be you in the ambulance, waking up from surgery in a “free standing clinic” being rushed to a real, full service hospital due to a potentially serious complication, possibly in need of the expertise of another specialist or physician. Specialized equipment, diagnostic tools and doctors will not be available at a “free standing clinic”. Don't put yourself in this potentially dangerous situation. Choose the resources of a physician, who operates in a world class surgical facility. Us: We perform all of our tubal reversals with a $120,000 precision German operating microscope! Why? The use of a large, powerful operating microscope can directly increase success rates and increase your chances of getting pregnant. The high level of magnification that this top of the line, state of the art equipment provides, allows the surgeon to reconstruct the precise layers of the tube in an incredibly natural way. In turn the tube will be returned much closer to its original state than when using substandard equipment like eye loops. The use of an operating microscope should be considered a top priority when choosing a facility, as you will get the best results when the best technology is employed. 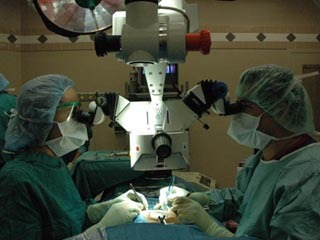 When researching a reversal facility, make sure that a large operating microscope, not eye loops are used in the reconnecting and reconstruction of the tube. 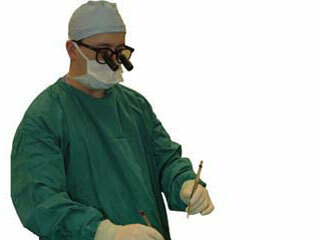 It is not necessary, however, that the surgeon use micro-surgical instruments to open and close the incision. Don't be mislead by claims from facilities that use eye loops to open and close the incision. Not eye loops - an inferior technique! 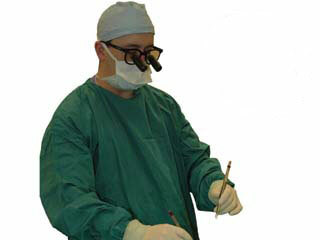 Them: They perform all of their tubal reversals using a pair of inexpensive, low magnification eye-glass loops! It is much more difficult to re-align and re-connect the inner canal (lumen) and the layers of the tube using cheap eye loops. Using substandard equipment to perform a reversal in many cases leads to a lower quality outcome which directly translates into lower success rates. In some cases, due to the low level of magnification that these lesser quality eye loops provide, doctors will sew the entire tube back together in one layer. This lack of proper layering and alignment can directly lead to lower success rates for pregnancy and an increase in tubal ectopic pregnancies. Us: We never use stints or dissolvable stitches to reconnect the tubes! 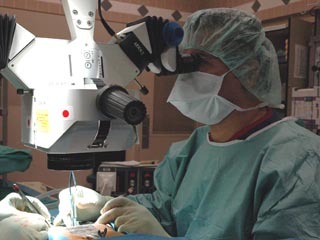 Because of our superior surgical skills and our use of a State of the Art, precision German operating microscope we are able to rejoin the tubal sections with a microscopic needle and nylon stitch that is smaller than a human hair. We have such great magnification that we do not use a stint, thereby saving the patient's tubes from the harmful effects of a stint. Them: They use stints and dissolvable stitches to reconnect the tubes! Why is it poor technique to use a STINT? Many doctors, in most cases the same ones who employ the use of CHEAP eyeglass loops, will thread a plastic or nylon tube known as a “Stint”, through the inside of the fallopian tube while they are reconnecting the two parts. When using these eye loops, it is necessary for them to use a Stint, a “crutch” device, because these loops are not powerful enough to provide adequate magnification to see the canal (lumen) that runs through the center of the tube or even the individual layers of the tube. When this Stint is inserted into the tube it can cause microscopic bleeds within the wall of the tube, thereby causing damage which will lower your pregnancy success rate and increase the chances of a tubal ectopic pregnancy. A physician who uses a powerful operating microscope is able to see the delicate layers of the lumen. Therefore, he does not have to employ the use of “crutch” devices like the Stint. 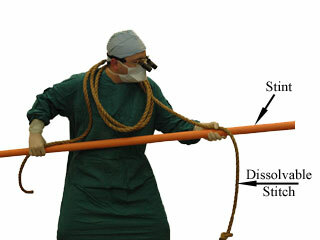 When you choose a physician to perform your reversal procedure, demand that he does not use a Stint! Why is it poor technique to use DISSOLVABLE STITCHES? Sir Robert Winston of London, England, the father of modern tubal microsurgery did impeccable laboratory research which showed the huge advantage of using tiny, inert nylon stitches rather than Dissolvable Stitches. Dissolvable Stitches create a reaction within the tissues that causes the body to make a pus reaction to get rid of the stitch, thus creating potential damage to the tube. This type of damage can lower your pregnancy success rate and increase your likelihood of having a tubal ectopic pregnancy. It is of utmost important to use tiny nylon stitches to provide the best outcome and success of achieving pregnancy. These tiny nylon stitches do not cause a harmful reaction in the body, in turn, increasing your chances of successfully conceiving. Demand that the physician you choose to perform your sterilization procedure, uses tiny nylon stitches! A STINT AND/OR DISSOLVABLE STITCHES MAY DAMAGE YOUR TUBES, DECREASING YOUR CHANCE OF GETTING PREGNANT! We'll tell you the truth! Us: Beware of claims that you will be totally healed and able to return to all normal activities within 7-10 days. No incision, regardless of the quality of the physician's work, is 100 % healed within this short time frame. In addition, heavy lifting and manual work can potentially tear your incision open and cause a hernia to form. Get a second opinion: ask your own family doctor or a local surgeon how long it takes to have 100% wound healing and you will find it's longer than 7-10 days. Beware of claims that the incision will only be 1 to 2 inches in size. If this were the case, a doctor would have very limited viewing space through such an incision to accurately repair the tubes. Beware of claims that “self retaining retractors” are not used during surgery. Without the use of some type of retractors, the doctor would not be able to see the tubes to repair them. Them: They will often give misleading information about their surgical techniques, costs, follow-up care and your ability to return to work! 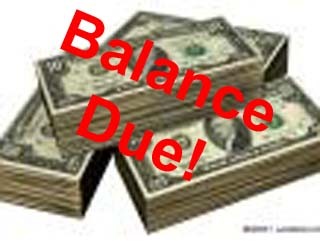 You may risk that you will not get your money's worth from facilities that make inaccurate claims. It is important for you to have accurate information when making your decision about where to have your reversal performed. You need to know how long the recovery process will take and what your restrictions will be in order to plan for returning to work and regular activities. Be weary of facilities that just tell you what you want to hear and not the truth. Some doctors do not perform reversals frequently enough to maintain a level of skill necessary for such a delicate micro-surgical process. Contrastingly, other facilities are like a revolving door, pushing through as many patients each day as possible. In the end, you are likely to pay for their expedience. Your reversal results will suffer on account of them rushing through your surgery. Even worse, as the days wears on, the doctors fatigue will have a negative impact on your outcome. We have no hidden charges! But some other facilities do! Them: Risk being charged for hundreds of dollars or even thousands of dollars of extra charges to get you to the goal of pregnancy! Many facilities will have you get pre-operative blood work done at home prior to coming for the reversal. Some of these tests can cost $500.00 or more and many well not be covered by any insurance you have because they are being done for a non-covered surgery. Additionally some facilities many have you take some medications the day before and the morning of surgery. These costs can be passed to you. Also make sure the hotel is covered, all transportation from the hotel to the facility, all post-operative pain medications and all post-operative wound care. Us: We have very high rates of success because we are very skillful and take our time with each and every surgery. When a surgeon performs tubal microsurgery on a frequent basis, his/her skills should be more finely tuned than one who performs this type of surgery only every so often. It is also important that the surgeon maintain his/her skills. So make sure that he/she has performed this surgery frequently and recently, as skill diminishes with time if not maintained. As the adage goes, “if you don't use it, you lose it”. 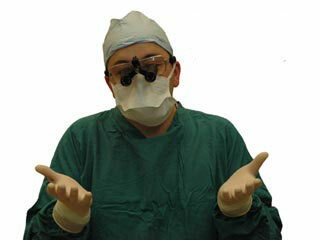 Ask the facility how many reversals the physician has performed and how many have been done within the past year. Remember you are paying for a skilled surgeon - make sure he/she is well practiced. Ask the surgeon what his/her personal rate of success is for your specific reversal procedure. Make sure that the physician is quoting his/her personal rate of success and and not a general figure quoted from the medical literature. Them: Some facilities try to do too many cases each day and their patients likely pay the price of their speed and fatigue. Some facilities are motivated by the bottom line. Their primary goal is to perform your surgery, get paid and move on. Most of these facilities do not provide free follow-up care, diagnostics and consultation which may be necessary for you to conceive. Make sure you choose a facility that will follow through and help you achieve your dream of becoming pregnant.
. . . to PREGNANCY! Us: We will see you through. 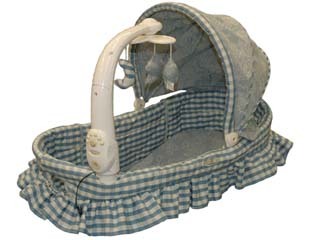 Our main goal is the provide the best sterilization reversal currently available. But more importantly, we are here to help you fulfill your dream of becoming pregnant.
. . . at the operating room! Them: Risk not being able to become pregnant because your reversal doctor won't provide free follow-up care! When you pay for a reversal, this procedure should include all the steps necessary for you to conceive. A large part of the process in becoming pregnant after your reversal includes follow-up care. 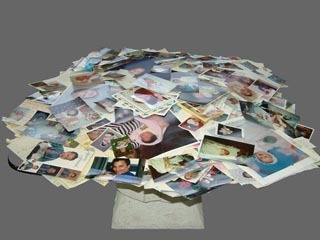 Make sure that you choose a reversal facility which includes this necessary care and treatment as part of the package. Read remarks from patients who went elsewhere.